If you’re an animal lover, CBD Oil for pets can help heal your furry friend. While many realize the therapeutic potentials of CBD Oil for humans, studies have shown that CBD, or Cannabidiol, can help boost animal immune systems and reduce pain as well. Humans have something in common with dogs and all mammals: We contain a biological system known as the Endocannabinoid System. This system is responsible for maintaining vital life functions for both animals and humans. Below, you will find out how CBD Oil works in harmony with your pet’s Endocannabinoid System and how it can promote a happier and healthier life for them. At Nature’s Script, we derive our Hemp Extract from Industrial Hemp grown in the United States. To extract our CBD from the Industrial Hemp plant, we use a CO2 Extraction process. In simple terms, the CO2 Extraction method uses pressurized carbon dioxide (cO2) to pull CBD from the plant. The CO2 Extraction process is environmentally friendly and regarded for producing the purest Cannabidiol. Above all, this extraction method allows us to deliver high-quality CBD Oil free of THC and any other compounds. How Does CBD Oil for Pets Work? The Endocannabinoid System is a complex biological system made up of endocannabinoids. “Endo” means “within,” so endocannabinoids are produced within the body. In comparison, Cannabidiol is a cannabinoid found in a plant. These endocannabinoids are molecules that stimulate cannabinoid receptors (CB1 and CB2) located throughout your pet’s peripheral and central nervous systems. Your pet’s ECS helps regulate essential functions like appetite, stress, pain response, sleep and more. CBD Oil assists in stabilizing your pet’s homeostasis – the process of maintaining conditions necessary for survival. When you introduce CBD Oil to your furry friend, it can significantly improve the functioning of their ECS. Animal's CB1 receptors work to sustain their brain, muscles, lungs, vascular system and reproductive system. Your pet’s CB2 receptors work to stabilize their spleen, skin and glial cells. Both cannabinoid receptors are also found supporting their liver, pancreas, gallbladder, bone marrow and brain stem. Ultimately, CBD Oil works to encourage a healthy equilibrium in which your pet’s body sends and receives chemical signals that relate to their mood, pain response and health. A 2018 study on CBD and dog osteoarthritis found that dogs who received CBD Oil had increased comfort and mobility upon returning to their home environment. Further analysis revealed that pet owners who administered a Hemp Extract based product to their pets saw relief from conditions such as pain, inflammation, anxiety, phobias, digestive system issues and skin issues. What Conditions can CBD Oil for Pets Help? Anxiety Relief - Cannabidiol works with your pet’s CB1 and CB2 receptors to help reduce chemical signals that may cause stress and phobias. Cannabidiol promotes a sense of calmness and tranquility. Appetite Improvement - Whether it’s nausea or digestive problems related to appetite, Hemp Extract Oil may help increase or improve your pet’s appetite by working with their CB1 receptors. Pain Relief - Hemp Extract Oil contains natural pain-relieving properties to help ease all levels of discomfort. Nature’s Script offers three different potencies of CBD Pet Oil for varying degrees of pain. Inflammation Relief - Inflammation can cause allergies, autoimmune diseases and muscle issues for your pet. Fortunately, CBD Oil contains natural anti-inflammatory agents that can help control their inflammation levels and protect them from external elements. Increased Joint and Muscle Mobility - CBD may help relieve pain related to your pet’s joints and muscles. Reducing mobility issues can help pets who are older and have trouble walking. Skin and Coat Protection - If your pet suffers from allergies, irritated fur or coat problems, CBD Oil may be the remedy. Hemp Extract Oil works with your pet’s CB2 receptors located on cells that control skin growth and oil production. Furry friends come in all shapes and sizes, which means CBD Oil for pets will metabolize differently in every animal. Like most supplements or medications, CBD’s effects may depend on factors such as your pet’s age, size and weight. We recommend starting with the lowest CBD dose if you are unsure where to start. Once you see how your pet reacts to CBD, you can always move up in potency. 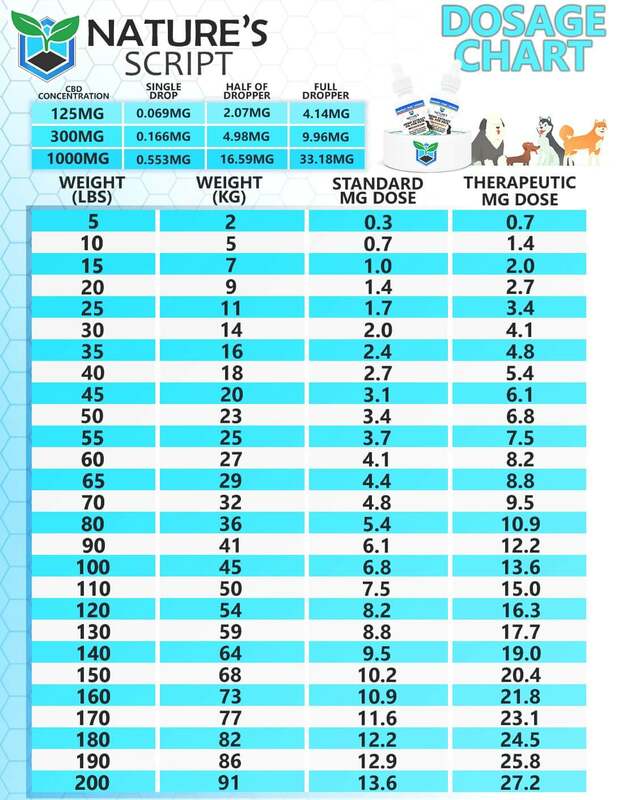 Nature’s Script has formulated a dosing chart based on your pet’s weight that you can view below. Standard Dose: General immune/health support. Situational, i.e., Separation, thunderstorms, travel, crowds, during grooming or situation that may cause anxiety. Overall, Nature’s Script CBD Oil for pets provides your best friend with a comforting feeling as well as pain-relieving sensations without any harmful side effects. We understand that your pet’s health is just as important as yours.